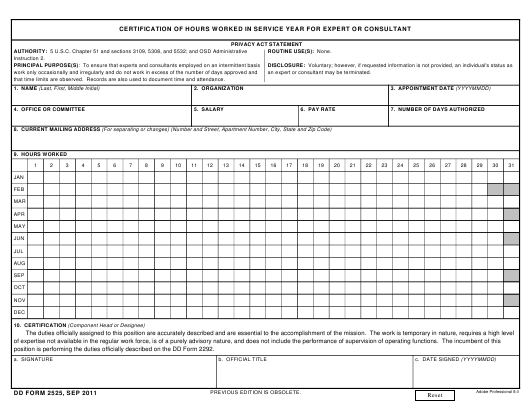 DD Form dd2525 - also known as the "Certification Of Hours Worked In Service Year For Expert Or Consultant" - is a United States Military form issued by the Department of Defense. The form - often incorrectly referred to as the DA form dd2525 - was last revised on September 1, 2011. Download an up-to-date fillable PDF version of the DD dd2525 below or request a copy through the chain of command. an expert or consultant may be terminated. that time limits are observed. Records are also used to document time and attendance. position is performing the duties officially described on the DD Form 2292.